Details at the end of this post on how to win a copy of Simon’s Cat, Off to the Vet and Other Cat-astrophes, along with a link to purchase the book. Do you watch the Simon’s Cat videos on YouTube? For a quick two or three minutes of fun and laughter, they can’t be beat. Be warned, once you start, it’s hard to stop! For his newest book, Tofield went to his vet’s office for how-to’s that make the vet trip a better experience for both the human and the cat. One tip from the vet is to leave the cat crate out at all times so the cat’s used to it. At the vet’s office, keep it out of reach of curious dogs, and don’t open it! Annual checkups are vital since cats tend to hide symptoms. A head-to-tail exam can find problems early on. Weigh-ins can give clues to a hidden illness—even a tiny weight loss can be a signal. Go to his YouTube channel to check out the video, www.youtube.com/watch?v=tkEC49vU2Wg and www.simonscat.com for his site. It takes two to three months to make an animated Simon’s Cat video for YouTube. Tofield is inspired by his own four cats who keep him supplied with ideas. If the new book is any indication, they’ve kept him busy! Cartoons include making the bed over a cat-sized lump that wasn’t there when you picked up the blanket, the cat vs. the mail slot, cleaning the litter box (and how the cat uses it again before you’ve even left the room), how a cat can win over a cranky neighbor, the cat vs. the mail slot from the mailman’s point of view and an all-time favorite, cats who have no sense of personal space when the human is in the bathroom. A crate is essential for taking a reluctant cat to the vet. In the cartoon, Simon attempts to lure the cat into a cardboard box with several openings cut into the sides. It’s a race to see if he can duct-tape it all shut before the cat escapes. It’s more than a little embarrassing to sit in the waiting room with a duct-taped box! Of course, the cat gets out and meets a Pug—who promptly marks the cat and the box. Hence, the tip above about keeping the cat crate out of reach of curious dogs. It’s impossible to find words to convey the hilarity that follows when the cat escapes the exam room, meets a bird, eats employee lunches, and generally wrecks the office. Of course, the cone-head collar is always good for a chuckle at the poor pet’s expense—or at least when the Pug kisses the cat while the collar is on. Whether you read it straight through or pace yourself with one or two cartoons at a time, this is a book that will cheer the gloomiest day. Add the videos, some snacks, a favorite beverage and a cat on your lap—it’s a little vacation in the middle of daily life. 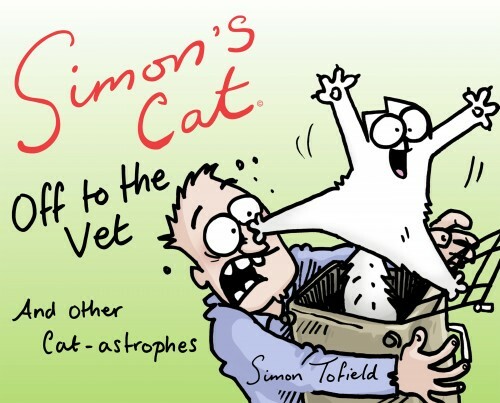 To enter to win a copy of Simon’s Cat, simply email KRL at krlcontests@gmail[dot]com by replacing the [dot] with a period, and with the subject line “Simon,” or comment on this article. A winner will be chosen January 9, 2016. U.S. residents only. If entering via email please include your mailing address, and if via comment please include your email address. Check out more animal rescue & pet stories in our Pet Perspective section. Advertise in KRL and 10% of your advertising fees can go to a local animal rescue. I have watched Simon’s Cat on YouTube (which is always enjoyable) so I can’t wait to for the book. Thank you for the giveaway. I would love to read this – especially with the cats we have had over the years, and their various cat-sonalities! Without the laughter given to us by our pets, and the love given and received, I would be a much poorer person to have never had these precious fur-babies! Thank you for the chance to win!